I love to look at pictures of peoples’ dogs. Pictures of kids — they’re ok. Artistically shot photos of a gourmet meal at a Michelin-starred restaurant — ho-hum. Vacation snapshots — it depends. But show me a picture of a dog and you’ve got my attention. If said dog is hiking, swimming, riding a motorcycle or just doing anything fun and interesting — even better! It’s very easy for a dog owner to fall into a rut and keep doing the same things day in and day out. The walk around the block. The game of fetch. The grooming session. The play session. And most dogs will just quietly accept this fate. What can they do, complain? The thing is, even if they complain they’re easy to ignore. It’s entirely up to the dog owner to want to spend the time, effort, and planning for their dog to have a fun and action-packed life. All this time I thought I was just admiring dog photos, what I’ve really been doing is keeping a mental checklist of stuff I want for my dog. It’s like his bucket list, except it’s NOT a list of things for him to do six months before he dies. No, not that kind of bucket list. That’s so morbid. Run around in a farm – done LAST WEEK! Number 5 is a big deal! Before I had Momo, there were Ella and Coco the Australian Shepherds. Ella would have absolutely loved the farm. Coco, I’m not so sure. During Ella’s time I always regretted that I wasn’t able to get her a flock of sheep to shepherd. Still, it took us a few weeks of owning the farm before we brought the dogs over. We didn’t take them right away. While we were very excited to bring them, there was also fear of the unknown. What would happen when we took them to the farm? Would they be ok? We wanted everything to go smoothly. The husband was worried about the barbed wire. There was barbed wire strung across certain sections of the farm. The husband imagined that Barkley would not see the barbed wire and run straight into it. OUCH! I didn’t think that was a likely scenario. My main concern was all the cow and carabao poop! 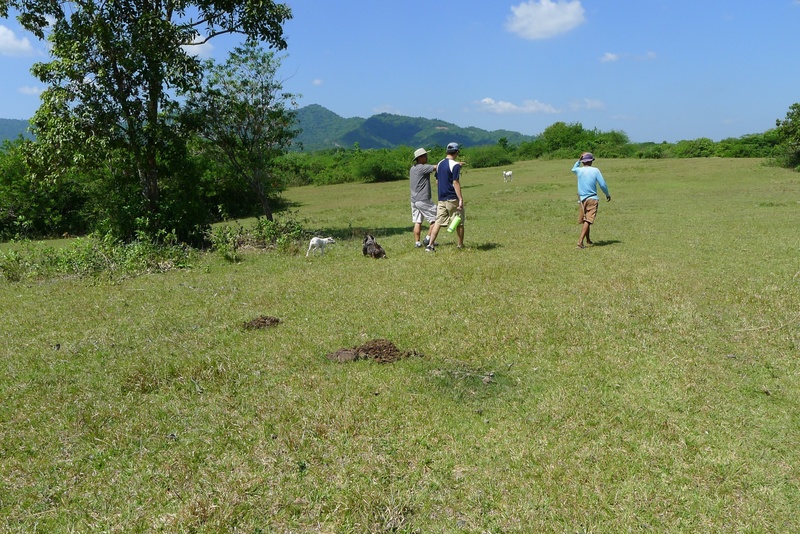 There were clumps of dried cow and carabao poop scattered all over the parts that were used as a grazing area before. I was quite sure that both dogs would roll in the poop and even try to eat it. I had seen them go nuts over horse poop in the polo field before. There was also a lot of aroma, a shrub with long, hard, sharp thorns ready to attack a pair of unsuspecting city dogs! Then one fine sunny day after most of the barbed wire had been taken down, the poop bagged up, and the aroma cut down, we were ready for our day with the dogs at the farm! As we expected, both Momo and Barkley loved, loved, loved running around the farm! They ignored the poop that remained on the ground and only showed mild interest in the sacks of poop piled up under a tree. Maybe they were too busy exploring the rest of the farm for the piles of poop to hold their attention. They didn’t run into any aroma thorns or barbed wire, thank goodness! I was also worried about ticks. Rainy season is when the ticks get bad. But it seems likely that there are more ticks in my own neighborhood than at the farm. There are no people or animals at the farm! Momo ignoring the cow, poop, and other dog. We should have been more prepared for the heat. We arrived at the farm mid-morning and it just got hotter and hotter as noon approached. I had a water bowl, two liters of cold water, and kept offering them a drink. They were still panting heavily. Their tongues were getting wider and wider and hanging out further and further from their mouths. 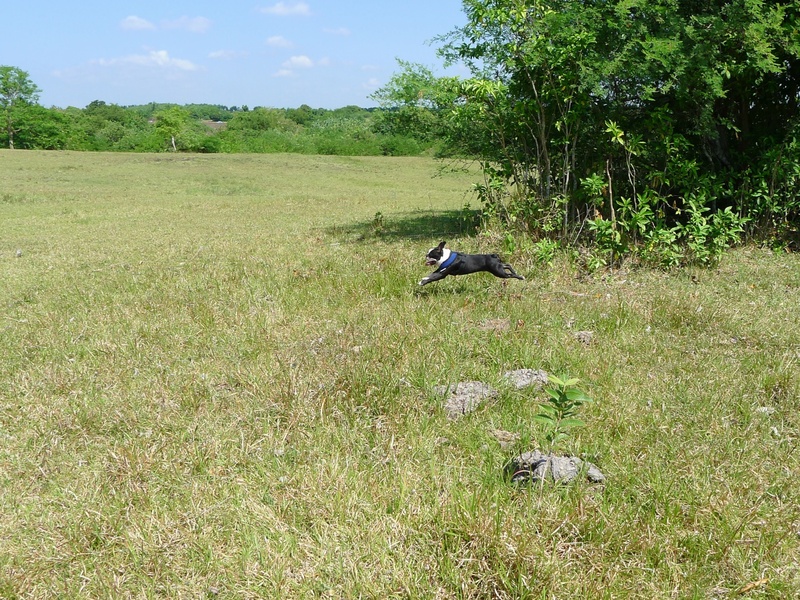 At one point, I told Momo to wait for me under the shade of a tree while I went to look for Barkley. He had run off somewhere and I couldn’t see him. I had visions of him lying somewhere, collapsed from heat stroke. What a relief to see him come running when I called. I could pinpoint where he was coming from by the sound of his breathing. It was so loud! I carried him to the shade and poured some water on him. 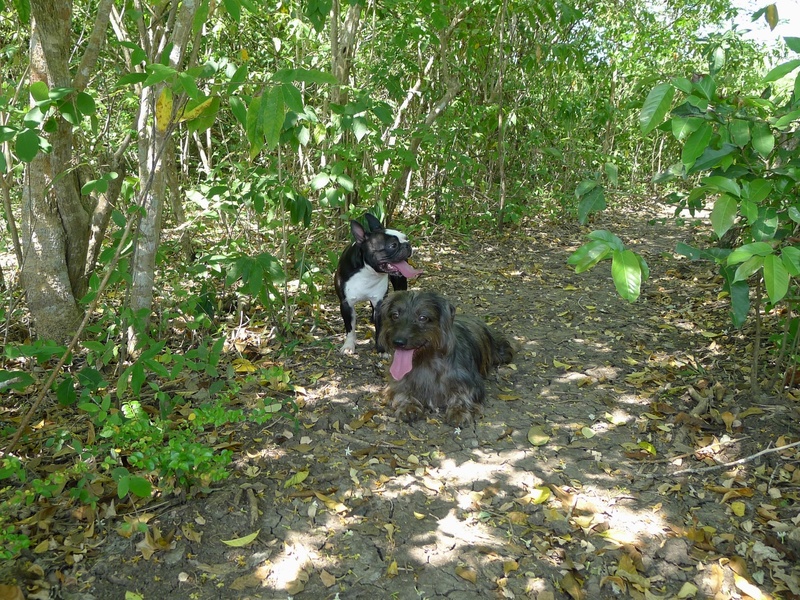 The second time we took them to the farm, we took the dogs to the water pump to cool them down. We also had take them there to wash off the cow poop that Barkley rolled in! 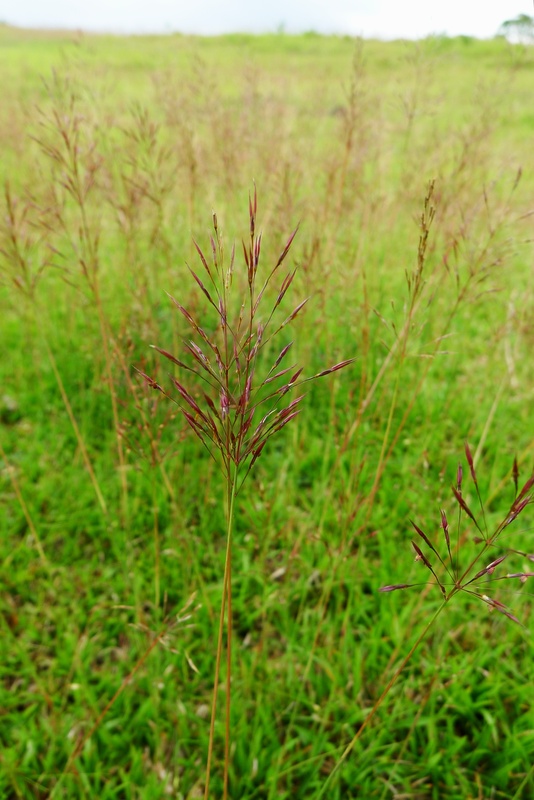 There is a small weed called amor seco that grows all over the farm. It usually comes out during rainy season. 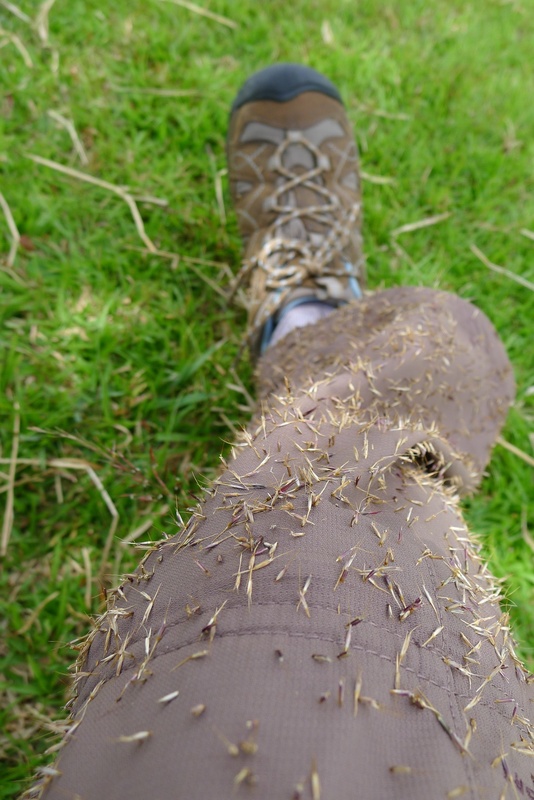 It has these seeds that stick to your pants and socks, and if you’re a dog, your fur. The seeds are long and thin and sharp on one end. Some of the seeds work their way into Momo’s fur and stick like splinters in between Momo’s toes and in his armpits, under his chin and all sorts of places. I learned the hard way that it’s better to comb the seeds out thoroughly than to try to shampoo them off. I didn’t expect that I would be picking out amor seco seeds even three days after visiting the farm! Next time, I’m bringing a flea comb. I think that will get out most of the seeds, before they get in too deep. Next on the agenda: check out the beaches in the neighboring town! Didn’t realize the amor seco could be that nasty. Good to know your dogs are enjoying the farm as well! And, the seeds are the same color as Momo’s fur! I need to run my fingers through his fur and “feel” for them. Love the bucket list! Great idea! Gonna make sure I take it to heart for my babies. You can check them out on my page if you like doxie pics! Thanks for visiting my blog! Congrats on your puppies!